The most frequently asked question I get from our younger visitors is "how do you get out?" It does appear from the visitor side that when I'm in the shorebird exhibit I am in fact stuck since there's no visible door. 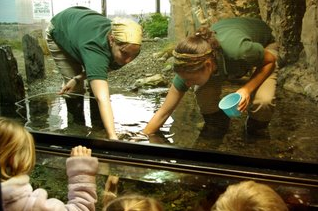 Here you can see my two long-time volunteers, Becky and Julia, behind the mesh feeding the fish. So how do we get in and out? Check back Friday to learn the answer! Spring has sprung in our shorebird exhibit! Welcome to our Shorebird Exhibit!